Jonti-Craft 0537TK Book Browser by Jonti-Craft at Indsight. MPN: 0537TK. Hurry! Limited time offer. Offer valid only while supplies last. 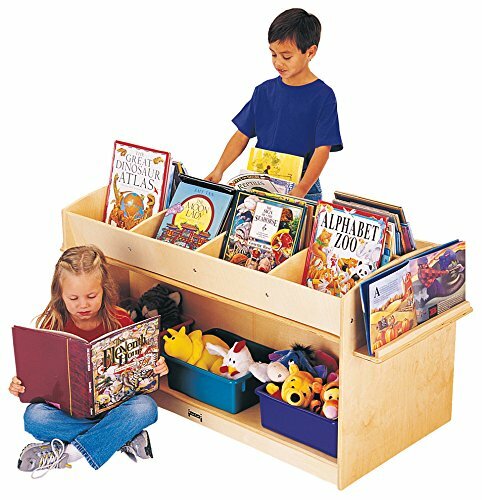 Mobile cart for displaying books plus storage below for puppets and supplies. Book display easels on both ends. KYZ Safe edges. Eight section top. Mobile cart for displaying books plus storage below for puppets and supplies. Book display easels on both ends. KYZ Safe edges. Eight section top. Caster mounted. Minimal assembly. Bottom shelves are 46" wide x 11" deep x 14½ high.